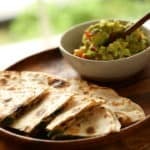 Learn how to make my Veggie Quesadilla Recipe with Chunky Guacamole, a great vegetarian dinner idea that fast, easy and delicious! Includes video tutorial. 4 flour tortillas, if you can get the uncooked variety like Tortillaland, even better! Heat olive oil in a large skillet. Saute red onion until soft and tender, then add mushrooms and cook until they are tender, add spinach and cook until wilted. Season with salt and pepper to taste and set aside. Prepare guacamole. In a small bowl combine the avocados, tomatoes, red onion, lime juice, salt and pepper, hot sauce and cilantro. Stir gently to combine and transfer to a small bowl. Heat tortillas on a griddle (cook them first if using the uncooked variety) add cheese to 1 tortilla, place veggies on top, top with remaining cheese. Heat until cheese has melted, flipping mid way through. Cut into wedges and serve with the guacamole!